What Is Being Done? 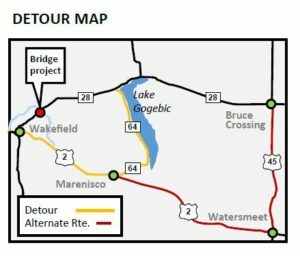 The Michigan Department of Transportation (MDOT) is removing and replacing the M-28 bridge over Jackson Creek east of Wakefield in Gogebic County, beginning in late May, 2018. When Will This Be Done? The project will begin on May 29, 2018, and is expected to be completely open to traffic on Sept. 8. All work will be completed by Sept. 21, 2018. How Will Traffic Be Affected? Eastbound and westbound M-28 will be closed at the bridge. A detour is planned to be in place from May 29 to Sept. 8. Access will be maintained to businesses and residences along M-28. Detour Route Information: Eastbound traffic will be detoured onto US-2 at Wake-field, then north onto M-64 and back to M-28. The route will be reversed for westbound traffic. The approximate length of the detour is 33.5 miles. Long-term Benefits: The existing bridge, built in 1932, has reached the end of its service life. The new bridge will be 5 feet higher in elevation, 20 feet longer, and 11 feet wider than the current structure. The new bridge will take some of the dip out of the roadway and be less prone to damage from high water. The overall life expectancy of the new structure is 75 years with routine maintenance.